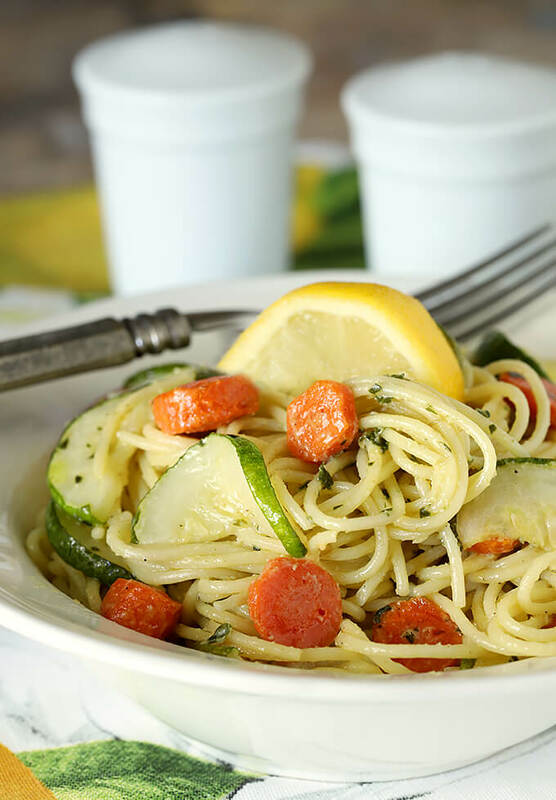 Garlic Pesto Pasta with Carrots and Zucchini is a one pot meal that is easy to make and immensely satisfying. 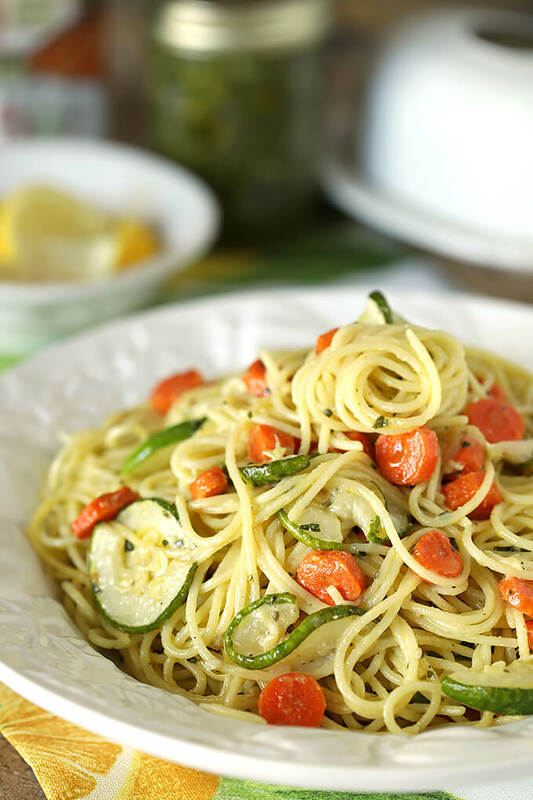 Serve with chicken or fish or as a standalone vegetarian dish; it’s perfect! I originally made this dish right after I had pulled up all of my basil and made some homemade pesto. It is amazing what the return is for a HUGE basil plant; I was lucky to get a little jelly jar of pesto from my efforts. It went too fast and I wanted more of this pasta dish so I’ve been using a purchased product and it’s been great too. While I added zucchini and carrots to my pasta; use your imagination. Know what my imagination led me to? I had both vegetables in the fridge as leftovers…that took them to the top of the list! I had pulled this pasta together midday and by evening some of my favorite kids had showed up at my door. I don’t kid myself; while I know they like me OK, it is the beauty of a room in my house that they can all escape to from their individual homes that draws them here and OK, sometimes maybe the food. It’s usually Lee from across the street and Zoey and Lily, twins who live up the street, that arrive as a pack. These three have been friends since all of us moved onto this street at the same time five years ago and it’s cute to see them together. Lily and Zoey are not identical and their personalities are SO different and Lee is a great buffer; he likes them both. Lee is also the pickiest eater of the three. I have managed to get him to try some new things that he used to make faces over and that’s a nice reward. As is getting him to stop with the faces and comments. He would tell you now, ‘Don’t yuck her yum!’ as I have preached enough they get it; you don’t have to eat it but you don’t get to make faces or disparaging comments either…a good life lesson, right? So, when I asked if they wanted some of this pasta that I had on the stove, two of them begged me to remove the veggies. I do know when to pick my battles so agreed to that and served all of them a dish with some garlic bread on the side. What was the verdict? OMG…the love was amazing! Lee, who is so hard to please, said to me almost verbatim that this was the best pasta he had ever had in HIS LIFE and made me promise that I would get the recipe to his mom! The promise was made and then…the holidays hit and life got wacky. I never forgot that I had made this, but I sure didn’t find time to post it for you either and there is no time like the present. 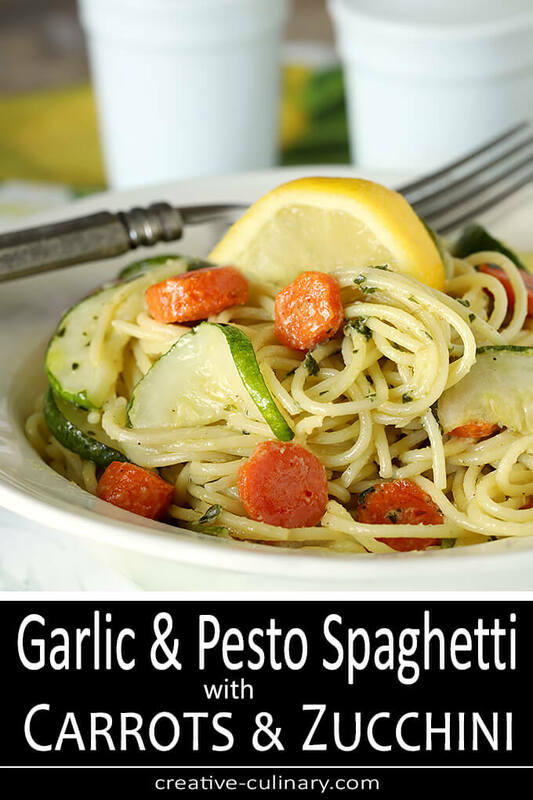 I loved the basic flavor and yes, I added carrots and zucchini but honestly, add what you have or what you love. I could see mushrooms and peas or broccoli instead of the zucchini. In summer try it with some garden tomatoes…I can’t wait! I think the key to the success of this simple dish is cooking the noodles in broth; they are so flavorful. Reminds me a bit of this One Pot Tomato and Basil Pasta but this has a lighter sauce. Both are fantastic…and EASY! In a large pot, combine the oil and butter and melt over medium low heat. Add the onion and cooked until translucent (about 5 minutes) Add the minced garlic and saute for 1 - 2 minutes more until garlic is fragrant (watch carefully, it should not brown). Add the chicken stock to the pot, raise the heat to medium-high and cook until the stock comes to a boil; add the noodles to the boiling broth. Cook the pasta according to package directions; the pasta will absorb almost all of the broth. When pasta is cooked through, remove it from heat and add the basil pesto and heavy cream and mix in gently. Mix in the carrots and zucchini. Season with salt and pepper. Serve and garnish with a wedge of lemon. I never tire of pasta — I could probably eat it every day. This looks terrific — loaded with flavor and goodness, such a nice, bright dish. Bet its flavor is awesome, too. It has to be — it’s kid-approved! Thanks.